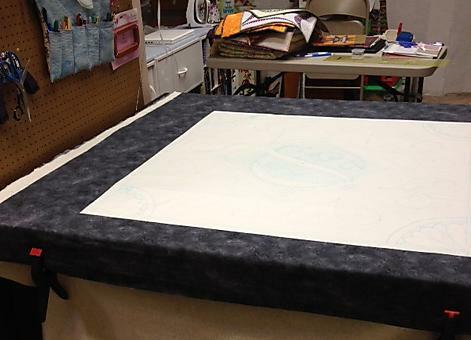 I often get asked how I baste my quilts, so I thought I would take pictures of the process with the wedding quilt. I have a table that is about 50×60 inches – which is a nice size although I can not quite reach to the middle if I am sitting. 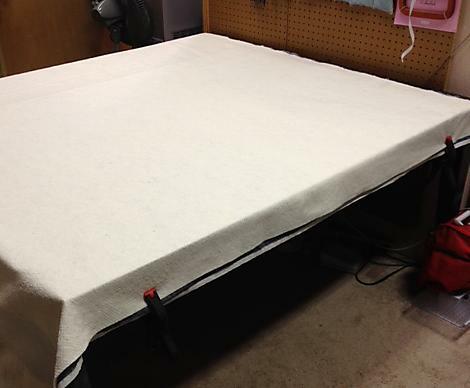 I lay the backing fabric right side down on the table and clamp it to the sides with hand clamps. I then lay the batting on top. When the batting is in the right place, I release the clamps and then re-clamp the backing and batting together. I then lay the top on. I make sure that I have at least 2 inches all the way around the quilt. This ensures that I have something to hold on to when I get to the borders. I actually have more difficulty quilting the borders then the center of the quilt because there is less to hold on to. I do not leave too much around the edges, as I have on occasion flipped the backing onto itself and actually quilted it down. (not a happy moment) When I am happy with the position of the top, I re-clamp the three layers together. I am then ready to baste. 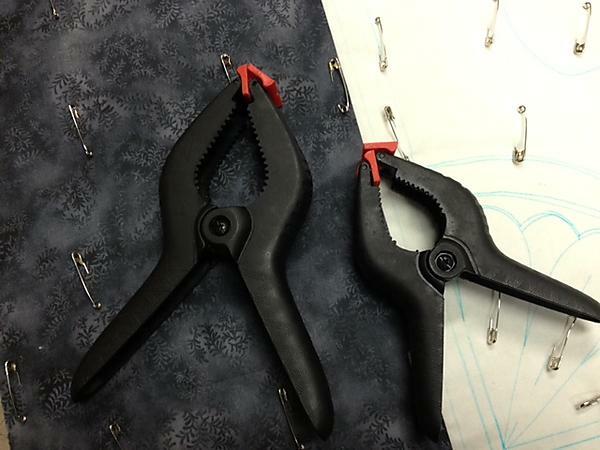 Here is a close-up of my hand clamps. The only disadvantage is that they are hard to open when my hands are hurting. 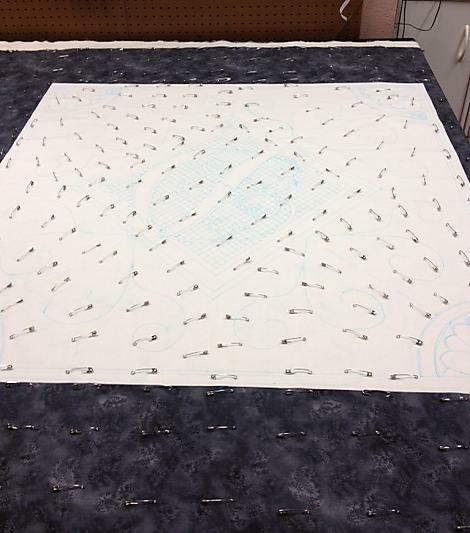 I pin bast my quilts with medium sized safety pins. This is a personal preference. The “experts” say to use the small pins, but my hands get too sore and I have good success with the larger pins – so I am sticking with it. When I have all of the top that fits on the table basted. I release the clamps and move the quilt, then re-clamp. 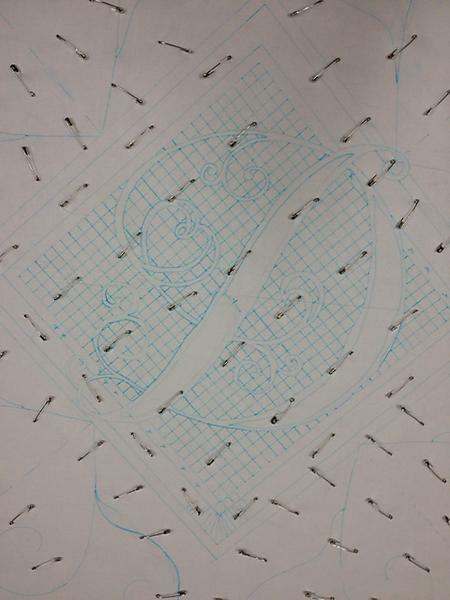 The clamps help keep everything tight, which actually makes it easier to bring the pins back up to the top. I finished marking the center of the quilt. I am waiting on the borders. I have an idea but want to be able to change my mind when I see the center. I do not usually ask any questions – not that I do not have questions – but here goes. When joining fabric for a backing, do you leave the selvage edge on or cut/rip it off? Do you press the seam open or to one side? I am just curious. I have my way of doing things and am happy with the results but wonder what other quilters do and why they choose that option. Hi Ingrid, I passed on your info to the guild! I hope you get response. I remove selvage and press to one side. Just my preference, have never been told to do that way or not.